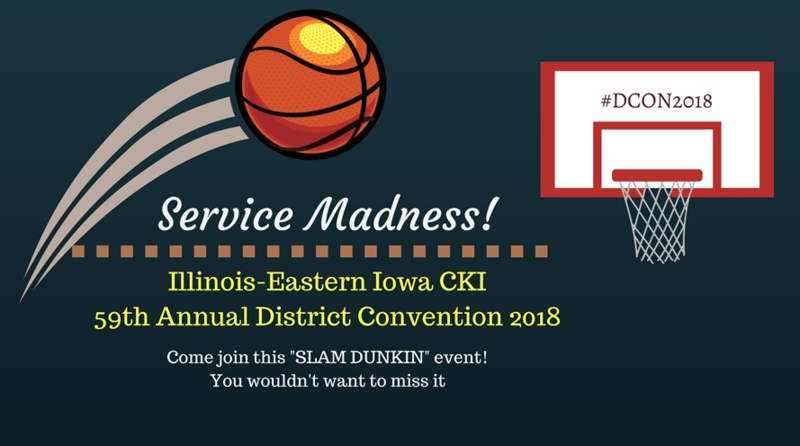 The 59th Illinois-Eastern Iowa District Convention (DCON) is an opportunity for all clubs to come together for a weekend of celebration – with club awards, service ideas, district officer elections, membership recruitment workshops, amendments, club officer advice, and games and activities. All clubs are highly encouraged to apply for the many club awards we offer, as well as consider running for a district office or applying for a scholarship. Bring your club members and rock out to a great year of service! Registration includes Saturday lunch and dinner and Sunday Breakfast, Convention Materials and Entertainment. Hotel reservations are to be made by the attendees. Registration cost does not include housing. Cost: $105.00 plus tax per night. Attendees are to make their own reservations for this event. You are invited to the Illinois-Eastern Iowa District’s 2017 District Convention! This is an opportunity for all clubs to come together for a weekend of celebration – with club awards, service ideas, district officer elections, membership recruitment workshops, amendments, club officer advice, and games and activities. You are invited to the Illinois-Eastern Iowa District’s 2017 Holiday Embrace and Winter Escape. Join us in Oak Brook for a funky fresh weekend – dinner and dance, silent auction, 50/50 raffle, photobooth, and lots more. Dance the night away to some funky fresh tunes while raising funds to suport the Illinois-Eastern Iowa District Project: the Spastic Paralysis Research Foundation. Funds raised will help to fund researchers who are working to develop a cure for various types of Spastic Paralyses. For over 60 years, the Kiwanis Family of the Illinois-Eastern Iowa District has been working to support the foundation. Join us Friday evening and Satuday morning for Winter Escape! Before Holiday Embrace begins, join Circle K’ers from across Subregion C as well as other districts for some service, fellowship, and leadership. On Friday, we will kick off the night with the Mr. and Ms. Sub C Pagaent where contestants compete for the coveted crowns. On Saturday, we will be spending the day serving the Schaumburg area and volunteering with Feed My Starving Children and packing meals for hungry children around the world. Visit tinyurl.com/funkyfreshfellowship to register and get more info!